Stephen Curry is the hottest name in the world of basketball today. With his wide range of skills, he is known for scoring effortlessly and is already one of the greatest point guards of all-time. 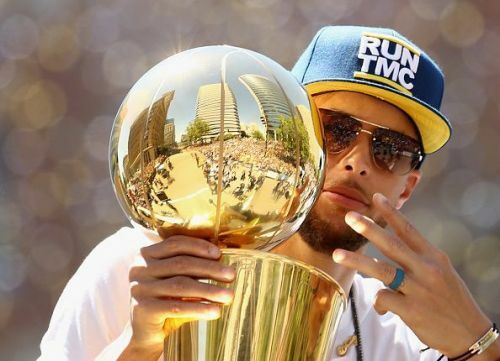 Curry has achieved so much in a very short period of time and became the first unanimous MVP in the history of NBA when he got his hands on the Maurice Podoloff Trophy in 2016. He has revolutionized the 3-point shooting and knocks down 3-pointers from way downtown with very high accuracy. The three-time NBA champion, after years of being underpaid, signed the then-richest contract of $201 million for 5-years during the 2017 off-season. A career filled with accolades, Curry holds the record for highest 3-pointers made in a season with 402. He is currently seventh on the list of career 3-point scoring leaders and its only a matter of time before he reaches the number one position. Under his leadership, the Golden State Warriors raised the bar and touched new heights. Over the years, the team has become a force to reckon with and won three NBA titles after making it to four straight finals. The Warriors played against the Cleveland Cavaliers in the finals on all these occasions. This article is dedicated to Stephen Curry's basketball greatness as we take a look at five of his most memorable performances against their arch-rivals. The Warriors and the Cavaliers met in the finals for a fourth straight year and the odds were stacked against LeBron James and the Cleveland Cavaliers. In the Western Conference Finals, the Warriors came back from a 2-3 deficit to beat the Rockets. Curry averaged 25 points in the series with a field-goal percentage of 47.0. 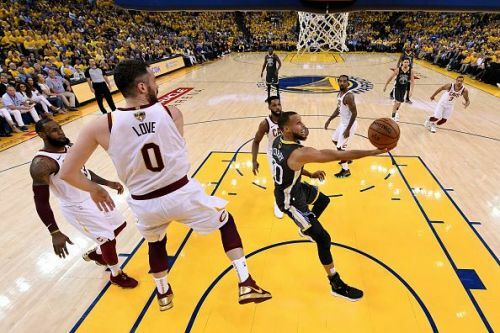 In Game 1 of the finals, Curry scored 29 points and helped Warriors beat the Cavaliers in overtime. In Game 2, he continued his dominance and dropped 33 points on a 11 of 26 shooting. He exploded for 16 points in the forth quarter and the Cavaliers were blown out by 19 points. Curry entertained the home crowd shooting some ridiculous three-pointers and finished with 7-15 from downtown. He was well supported by Kevin Durant and Klay Thompson who combined for 46 points on 18-27 shooting. With this win, the Warriors had extended the lead to 2-0 and demoralized the Cavaliers team. Warriors went on to sweep the Cavaliers in four games and won their third NBA title in four years. The unanimous MVP averaged 27.5 points, 6 rebounds and 6.8 assists and 1.5 steals over the course of four games.